Are your chairs looking tired? your chairs at a fraction of buying new. M B Upholstery has built a reputation for providing high quality refurbishment of office chairs and partition screens for the business sector since 1993. The work is carried out by upholsterers who have 20 years experience working in this sector, refurbishing chairs from straightforward typist/operators chairs to multi-function executives. Our aim is to send your chair back to you looking as close as possible to a new chair, with quick turn around and a friendly and efficient service. Chairs we would have written off in the past have been rejuvenated for a fraction of the cost of buying replacements. We provide a full re-upholstering and repair service for your old chairs, saving your company money. We can service, clean & repair your chair at your place of work and out of office hours to minimise disruption. Without expensive showroom costs we can provide office chairs at very competitive prices with all the benefits of the backing of a large Company and the manufacturers guarantee. The environmental benefits of extending the life of your chair are obvious. 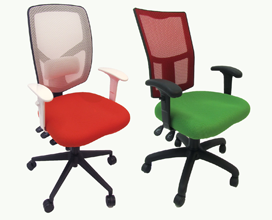 As a direct result of using our services, you can more that double the life of your chair. The savings between refurbishing and replacing your chair can be dramatic, often up to 80%. In many cases the mechanism (the main cost of the chair) far outlasts the life of the fabric. It therefore makes sense to keep the “still functioning” parts of the chair, and just replace the fabric. All the suppliers we use for replacement chair parts are bought from recognised and respected companies. The products meet all expected industry standards.